This tangy Lemony Salad Dressing has been an absolute lifesaver. It takes 5 minutes to make and lasts a whole week in the fridge. It's a super easy way to make dinner healthy and delicious. It's also vegan + paleo + Whole30 approved! This lemon salad dressing is a lifesaver. You know those evenings when you walk in the house after a long day and (without even thinking about it) open your junk drawer and start rooting around for a delivery menu? Ya, those. No stranger here! No judgment either. Here's the deal: Spend less than five minutes squeezing a couple lemons and whisking their juice with a few other healthy and tasty ingredients. Pour that lemony salad dressing into a jar and put it in your fridge. You're now 1/3 of the way through every dinner you will eat this week. #ProMealPlanner. 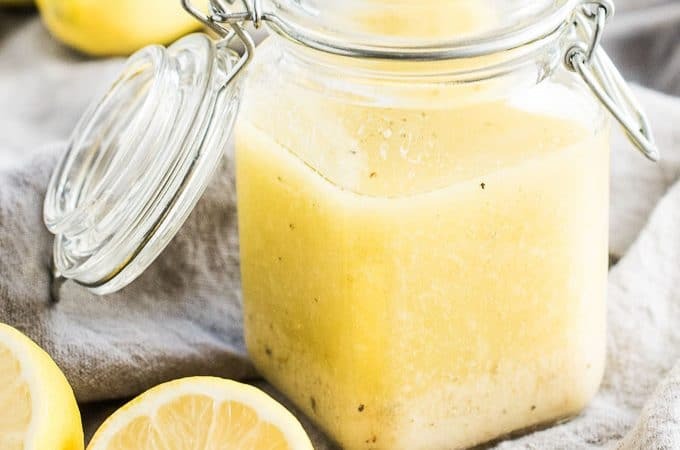 This is a Whole30 salad dressing, but you don't need to be on the program (or even know what it is) to keep a jar of this lemony deliciousness in your fridge. It's essentially a simple lemon vinaigrette that goes perfectly with any green salad. I always keep a bag of prewashed lettuce greens in my fridge. Often, my salad looks like a few handfuls of those greens tossed in this lemony salad dressing. See that pic above? Yep, that's what salad looks like when it's been a long day. Super basic, my friends! Of course, you can get all salad superstar and add lots of other veggies, nuts, fruit, and maybe even some cheese. No one is ever going to complain that their salad has more than just greens in it. But I want you to know, if you're short on time, some greens + this lemony salad dressing is all you need. Feeding yourself and your family healthy and delicious food doesn't need to be complicated. ♡ To make a super speedy and healthy dinner to go along with your simple salad, put some quartered potatoes and some chicken (I like thighs best) on a baking sheet, salt, pepper, and oil them up and bake them for a half hour-ish. It'll add an extra five mins of prep to your dinner and you'll still be eating before your delivery dinner would have arrived. If you love this Lifesaving Lemony Salad Dressing as much as I do, make sure to give it a 5-star rating in the comments below! Add all the ingredients to a medium sized bowl and whisk hard for 1-2 minutes, or until the dressing begins to look creamy. Store in a sealed jar in your fridge for up to one week. I only use one table spoon of the mustard, a really quick, simple yummy dressing! I’m so happy to hear it was a hit! I love all salad dressings especially vinaigrettes. I made this one and used it for a Cobb salad but I really didn’t like it. I was really disappointed after looking at the reviews and it definitely wasn’t what I expected. I would not make this dressing again. It would probably be good as a chicken marinade though. I just was very disappointed and didn’t like it on my salad. I’m sorry to hear you’re not a fan. This is so delicious and fresh. It is my new favorite dressing.! Made this dressing it’s my go to dressing all the time I even use it on chicken yum. Such a great idea to use it on chicken!! Can you use lemon juice from a container instead of juicing lemons? That’s all I have on hand and it looks so good I want it NOW! I’m so happy to hear you like it! It really is lifesaving, isn’t it?!! Oh my god…this is absolutely delicious. New go-to dressing….I can’t wait to try it on everything!!! Thank you! I’m so happy you love it as much as I do! I just love this dressing! So far, I have used it on some roasted chicken & vegetables and a chopped cabbage, fruit & nut salad and it was fantastic on both. This will be my go-to homemade dressing from now on. So good! Thank you! I absolutely LOVE that you used this on roast chicken. I’m going to try that! Do you just leave the garlic clove whole? It never says to mince…. Oops is right! I must have gotten distracted then forgot to change that. It’ll all good now. Thank you for the reminder! I love a good salad dressing and anything lemon is a personal favorite. This looks like the perfect lemon dressing! ? Thanks, Alida! Lemon is my fav, too!! It looks so yummy. I am definitely going to try it. Love you blog, fun recipes. This dressing looks great, simple and flavorful. One question, what is Dijon Vinegar? Possible typo?